If your little one has been diagnosed with acid reflux, or you’re concerned they may have the condition, it can be pretty worrying. Obviously, as a parent, all you want is for your child to be happy and healthy. So, when something’s wrong, you instantly want to fix it. Here, you’ll discover everything you need to know about acid reflux in infants. From what it is to how it can be treated – it really doesn’t have to be as scary as you might think. Acid reflux, otherwise known as Gastroesophageal reflux (GER), occurs when the contents of the stomach are brought back up. When they reach the esophagus, it can cause uncomfortable and sometimes painful, heartburn. So, if you find your baby is spitting up a lot, it’s a sure sign they likely have the condition. What you may not know, is there’s actually two types of acid reflux your baby could be suffering from. As well as standard GER, there’s also a more serious form of the condition known as Gastroesophageal reflux disease (GERD). This tends to be a longer lasting problem which can even stop your baby from feeding properly. It’s important to have the condition diagnosed properly to ensure baby receives the best possible treatment. Some of these symptoms can relate to other problems which can make it difficult to diagnose acid reflux. That’s why it’s so important to seek a proper diagnosis from a doctor or health professional. If your baby has the more serious GERD, they will also typically experience symptoms such as difficulty breathing, irritability and coughing. Acid reflux in babies is treatable, but the majority of the time no treatment is actually required. However, if it is persistent or they’re diagnosed with the more severe GERD variation, several treatment options may be prescribed. Treatment will depend completely upon your baby’s age and specific symptoms. Medications, feeding changes and even surgery can be used to treat acid reflux. Medications can be used to limit the amount of acid which builds up in baby’s stomach. It’s typically used on a trial basis after attempts have first been made to change their feeding habits. The main medications used to treat GERD include H2 blockers and Proton Pump Inhibitors. It’s so important to only give your baby medication if the doctor prescribes it. Never give your baby anything until it’s been approved by a doctor. In very rare cases, surgery may be recommended. This tends to be used if baby has severe breathing difficulties. Feeding changes do tend to be the first step, with rice cereal commonly recommended to be added to both formula and breastmilk. It’s also advisable to burp baby after they’ve drunk approximately 1-2 ounces of formula. You can also try holding your little one in an upright position for around half an hour after they’ve been fed. Could Acid Reflux Be Linked To Other Issues? It is possible your baby’s acid reflux could actually be a sign of an underlying health issue. It can be quite difficult to tell, due to how common the symptoms are. Acid reflux symptoms can mirror many other conditions, which makes it vital to ensure you’re getting a proper diagnosis. Overall, acid reflux doesn’t tend to be serious and simple changes to the way you feed your baby can make a huge difference. However, it’s still important to seek advice from a doctor as they’ll be able to fully diagnose the issue and tell you whether treatment is required. 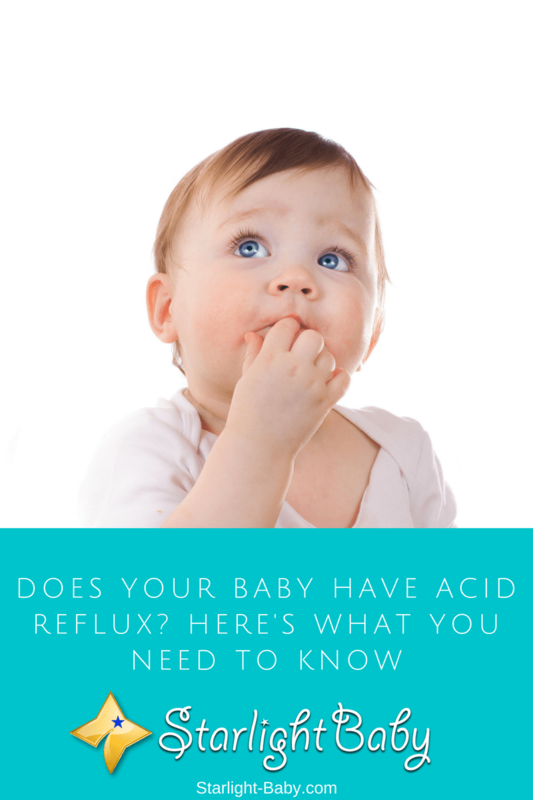 So, if you suspect your little one does have acid reflux, don’t worry! Most of the time it will rectify itself on its own and the condition isn’t usually serious. One thing that gave me joy reading this article on Acid reflux is that the situation can be treated once diagnosed. As a man, I’ve always felt bad when one of my cousin or some little kids around us develops one health challenge or the other. The thing is that they hardly feel okay while in such condition coupled with the fact that they can’t even say exactly how it’s happening to them. So, detecting the symptoms of this acid discomfort and getting treatment for the little baby is all we got to do as parents to give them the best life. You’re right. It always pains parents to see their child suffer from causes that are unknown, especially when the child is still unable to say where it hurts. Knowing more about acid reflux could give us a better idea if this is indeed the cause of a child’s discomfort. I’m glad you got my point on the need for parents to watch out for some of these symptoms on their kids. I don’t really think they should have done it, if not by reading about the useful information that is packed in this article. I really appreciate every moment that I spend on this blog for I learn things new. The pleasure is mine. I have to commend you for taking out time to do this on a daily and weekly basis for it is not easy. Helping moms and fathers to build their homes is a priceless piece of advice and I really appreciate. I am reading this article at the right time. Currently, my baby vomits frequently, he refuses to eat and he is also losing weight, he might have acid reflux. However, the article says the condition is treatable and in most cases, there is no treatment requires. This leaves me relieved. My advise is that you don’t conclude that such is the case as long as the doctor hasn’t made any diagnosis to find out. So, try and take him to the hospital and see what the teat results will show. I wish your kid a quick recovery. Yes, I agree with Henrywrites. I would say it’s best to take him to a doctor who would be the proper authority on your child’s health issue.